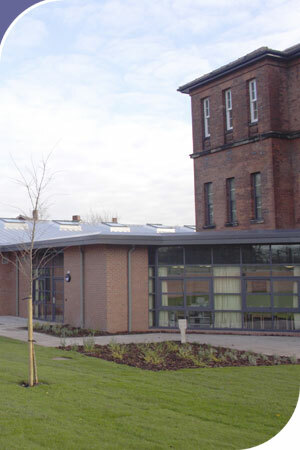 This £2.2 million project for North Staffs & South Shropshire NHS Trust consists of the construction of a new 12 bedroom, Psychiatric Intensive Care Unit for patients with learning disabilities and psychiatric needs including ancillary accommodation, social area, treatment rooms, dining, laundry / clinical rooms, ADL kitchen and bathrooms; together with staff accommodation. The new building is a single storey extension and is partly be constructed with a green roof and is naturally ventilated. Ancillary accommodation will be housed in two other refurbished floors of the existing Michael Flannagan building, a former Victorian isolation wing of the hospital. Access to outdoor space is important to patients and the development includes a new seare garden, together with landscaping to entrance frontages and associated car parking.